Yeah, okay, so I started this post around last Wednesday, but never got around to writing much. Even though it says Wednesday up there, it really is a week from my last post. I'm really sorry about this, but there are times when life (or judging Project 1 in MouseTime's Imagineer Game) get in the way of other things. Besides that, I have kinda been out of ideas for posts... But I have lined up a few posts and when I get the time, I'll have my sister teach me how to time my posts and then we'll see about having a more regular schedule, but for now, this is all you've got. So, without further delay, on to the post! So before I left on my camping trip, I told you guys about a historical post I was going to make on an attraction at Disneyland. Well, if any of you guessed it, I was taking about the Sleeping Beauty Castle Walkthrough (insert royal celebratory music here)! In early June/late May, construction walls went up around the long-closed exit to this attraction. Imagineer's were seen entering and exiting through said doors and while they stayed silent, the construction workers told guests that work was being done to restore the attraction. The problem with this being the obvious state of disrepair the attraction is in, much like the problem that they faced with the subs. You can't close an attraction for a decade or some, leaving the stuff just sitting there, and expect to come back and find it in perfect working order many years later. Besides that, it is also reported that the people who installed the "Remember Dreams Come True" fireworks also demolished parts of the attraction for show elements. While it is still unknown as to how much work needs to be done, the attraction likely won't open until the movie's 50th anniversary on January 29th, 2009. Sleeping Beauty Castle opened with the rest of Disneyland on July 17th, 1955, with nothing but empty space inside. Walt Disney soon assigned Ken Anderson, who worked on Sleeping Beauty, to create an attraction in the tight spaces of the Castle. Ken and his team designed a walkthrough attraction that opened April 29th, 1957. 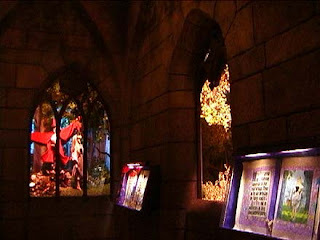 The original attraction featured the work of Eyvind Earle, who personally painted most of the film’s backgrounds, and was directly involved with the creation of the Sleeping Beauty Walkthrough. The attraction was redesigned in 1977 to add more movement and depth to the backgrounds of the dioramas. The new backgrounds had more detail, but lacked the original style and looked more like the Emporium windows. After the September 11th attacks, attendance plummeted. Disney cut costs where ever they could. The castle closed for refurbishment on October 7th, 2001. 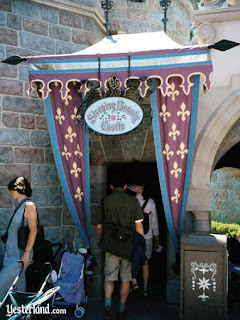 The castle slowly dropped off the refurbishment list, and the entrance lost its attraction sign. Attendance recovered, but the castle never returned. To this day, Disney has never given an official announcement or reason for its closure. A few rumors of the reason the castle closed have come and gone over the years. More popular ones include cost, security problems, and accessibility. For those of you who don't remember this attraction, I have found a video of it on YouTube. It think it would be interesting to see this attraction return. Besides restoring the attraction, I think some effort could be put into adding new lighting and effects to the dioramas, possibly even a little animation. I know there are many Disney fans out there who would love for this to come back, my sister being one of them. I'm sure that Disney will have to look into accessibility a bit, seeing as the average American these days can be a bit larger that those of old. If those tight spaces were a concern before, they're likely to be a problem now. Another thing that I have heard but never thought about before was the scare factor. I'm sure dark places with special effects did and will scare some kids, so there will have to be more lighting added. 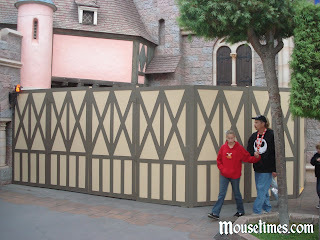 Sleeping Beauty's Jedi from the MouseTimes boards posted that "For what it's worth those very walls were down by the time I got to Disneyland on Wednesday and they never were up for the duration of my visit. I hope the walkthrough does come back, but I'm not going to be excited about it until they make it official." I don't know if this is a sign of the attraction not coming back, but I guess we will hopefully find out by January at the latest. Just a cool little side note here: While researching for this post I found a little blip about the drawbridge of the castle. For those of you who don't know, the drawbridge on the castle has been lowered twice: once for the opening of Fantasyland on July 17th, 1955; and again at the reopening of Fantasyland after a redesign in 1983. What I didn't know was that the gears that control the drawbridge were removed during a refurbishment in 1996 and have not yet been replaced. Interesting, huh? A few pictures of the attraction are below. A thank you to MouseTimes, MousePlanet, Yesterland, and YouTube for all the information in this article. See you all next time! The entrance to the closed attraction. A look inside the dark castle. The recently added walls around the exit to the attraction.